How does Supply Chain Finance differ from Invoice Discounting and Factoring? "How does Supply Chain Finance differ from Invoice Discounting and Factoring?" The supply chain finance is ready to be addressed, whether you see today’s trade credit situation as a business ethics issue or a technology readiness issue. Getting the “buy chain” flowing is essential to maximizing potential growth. Invoice factoring by selling the invoice to the bank at a discount. Explore the different options for financing and de-risking the supply chain finance and gain valuable insight into the possible benefits that could be achieved with the right technology and processes in place. The supply chain finance is ready to be addressed, whether you see today’s trade credit situation as a business ethics issue or a technology readiness issue. Getting the “buy chain” flowing is essential to maximizing potential growth. 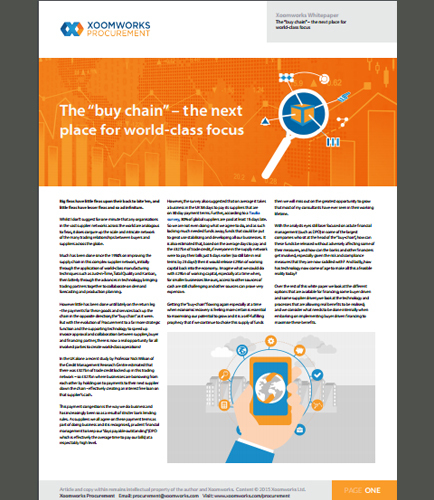 In this white paper on “The ‘buy chain’ – the next place for world-class focus,” learn more about the supply chain finance and real benefits in implementing buyer driven financing. It talks about: Different options available for supply chain finance Invoice discounting using the strength of the Accounts Receivable ledger to finance the loan Invoice factoring by selling the invoice to the bank at a discount. Implementing buyer driven invoice financing Approved payables supply chain financing or Reverse factoring Explore the different options for financing and de-risking the supply chain finance and gain valuable insight into the possible benefits that could be achieved with the right technology and processes in place.